I’ve been fascinated with tropical forests since I learned they existed. To a five-year old growing up on the flat, windy prairies of Canada, they were the perfect thing – lush, warm, mysterious, and full of danger, excitement, and adventure. The possibilities for discovery seemed endless. Today, as a postdoctoral researcher studying tropical forest livelihoods and restoration, I have to admit: I feel about the same. I know there are serious problems with the way we’ve managed our forests, and plenty of work ahead to repair the damage. But after the PARTNERS meeting this fall – a coming together of fearless, passionate, dedicated leaders – it feels like our forest adventure is just beginning. 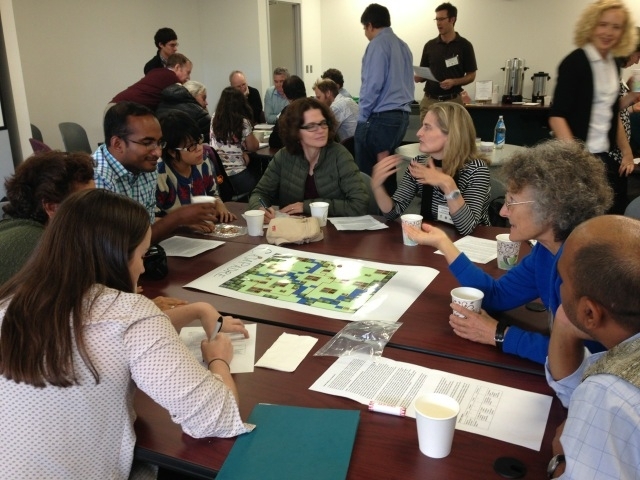 The PARTNERS’ research network hosted its second meeting at the Center for Environmental Sciences and Engineering at the University of Connecticut, Storrs, CT, from Oct 21–24. Sixteen months after PARTNERS’ extremely successful inaugural meeting in May 2014, it built on its momentum and connections. But the vibe had also changed. This may sound dramatic. But we’re not the only ones pointing out that tropical reforestation is key to solving a wide range of social and environmental issues, locally and globally. In the past 16 months, restoration has taken off as a solution to meet both the carbon and conservation agendas. With initiatives like the Bonn Challenge and the New York Declaration on Forests gaining traction, and forests making their way onto the COP 21 agenda like never before, agencies and governments everywhere are asking how we can reforest vast areas of land quickly, effectively, and while enhancing the livelihoods of the people who depend on it. And that’s exactly what PARTNERS has set out to do. Our first meeting focused primarily on setting the stage – taking stock of the tropical reforestation field, and it needed to go next. This second meeting was oriented towards action. The 49 participants from 15 countries included scientists, representatives and leaders from key organizations, such as the Stockholm Research Institute, Rainforest Alliance, the Union of Concerned Scientists, the World Resources Institute, the Missouri Botanical Garden, the American Museum of Natural History, CATIE, CIFOR, and ICRAF as well as 22 academic institutions. Each participated in one or more of five main working groups. 1) The Promoting Natural Regeneration group developed a plan to map priority areas for conservation using available ecological and social datasets. They are also working to identify places where forests are most likely to return through natural regeneration at the global level. 2) The Economic incentives for Natural Regeneration group focused on analyzing existing economic incentives for restoration across 14 tropical countries, spanning a range of geographic contexts. Across this diverse set of countries, the working group will analyze existing policies and projects that use economic incentives to promote reforestation. The outcome will be a multi-national dataset on how these various policies are constructed and their pros and cons in achieving restoration outcomes. 3) The Governance and Land Rights group focused on how legal frameworks and governance structures can promote reforestation. They are currently working on a study to examine where and when existing international policies have been used in innovative ways to conserve forests at the local and national levels. 4) The restoration value chains examined market incentives for products and practices. This group discussed options that ranged from international certification programs, to local private partnerships, considering both the risks of commodification and the safeguards and considerations needed for successful certification. 5) The Corporate Responsibility for Restoration group focused on making restoration attractive for corporate investment, and on creating public-private partnerships by linking various partners. Identifying ‘good news’ restoration stories was a potential project to come out of this group. Over the course of the workshop, we developed a sixth group to serve as an advisory committee to help policy makers make decisions around global restoration initiatives that would meet desired ecological and social goals. Creating clear channels of communication between members is a key PARTNERS priority. In addition to participating in working groups, participants gave presentations on relevant topics from both the natural and social sciences aimed at an interdisciplinary audience. Informative and provocative, these presentations served to push the conversation forward and inspired themes that continue to run through our work. But it wasn’t all work – or at least it didn’t feel like it! We paused to pilot an educational game created by Matt Fagan and Naomi Schwartz in partnership with the Network for Conservation Educators and Practitioners, in which players adopt the role of key stakeholders to negotiate where and how to reforest a landscape, while preserving their own interests. Watching a room of academics and researchers at the top of their fields roll up their sleeves and go head to head to plant – and prevent planting – little tokens of plastic forest was educational, inspiring – and hilarious. Cultivating a sense of fun and play is often overlooked, but a very powerful way of bringing people together. It certainly worked for this crowd. “Now we feel legitimized and supported by each other. We can go places where people weren’t going before. And that’s personal, so that feeds back to our own personal research agendas. If it hadn’t been for PARTNERS, I wouldn’t be nearly as bold, as assertive, and as “out-there” as I have been. I’d be much more afraid of being marginalized: oh, there’s the crazy woman again talking about secondary forests. Things are turning around, in part because we have the power of this group”. And cultivating that sense of community, transforming and inspiring and empowering people, is what changing the world is really all about.